Analog or digital, this pressing sounds absolutely amazing. I cannot imagine it sounding any better. Great dynamics, powerful sound. Kinda "useless" to listen to a digital recording on vinyl if you don't have a decent "vinyl equipment" (turntable, phono stage), but I can't imagine this sounding better on CD. Incredible pressing. It's like I listened to the album for the first time. Absolute MASTERPEICE on all levels: Writing, arrangements, production, engineering, mixing. One issue? "We'll be together" does not belong on this album IMO, it breaks the mood of the album, and comes off as jarring. It would have been better as a standalone single, rather than part of the album. A digital master like the first pressing. Sounds amazing! Clean and dynamic with a nice sound stage. It has a full and rich sound. 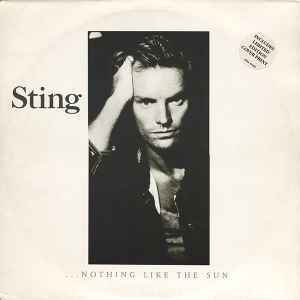 It sound almost the same as my 1987 pressing (https://www.discogs.com/Sting-Nothing-Like-The-Sun/release/7091165) but the sound is a little more expansive on this one. This one was done right! Unlike the description, in my Greek copy was included 4page printed insert. At the height of the fame-Sting to The Police decided in 1984-in the waiting room. The demand for Sting songs was greater than ever. His solo career was energetic. By its status as ' pop God ' knew Sting to bind the best jazz musicians, for a plate (The Dream Of The Blue Turtles) that the return to his early passion as a jazz musician. The catchy pop songs of Sting proved in this setting to enjoy in your results. By being rather too emphatically as world idealist, however, Sting got an image problem, making him especially in the British press could do any good. The public had no message to and also fell en masse for his later solo albums. In the second half of the 1990s and the new decade is the remarkably quiet around the man, who is really in 2007, lured into a reunion with his old band mates of The Police. Before that, he had ventured to classic English composer John Dowland (Songs From The Labyrinth). I have a UK pressing of this LP which doesn't match either version listed here. was like that before I replaced it with one with the label recess and thicker edges. This DTS-CD is a real gem for Sting fans. Although technically still Redbook CD, the 20 bit mastering and 5.1 surround treatments really sound quite good. SACD or DVD-A would have been better, but what can you do. There's a very open feeling in the mix, with some nice subtle elements placed in the rear channels. Sting's voice is nicely centered. The bass has a very solid, but not boomy sound.